Carson a tha sinn fhathast a’ leantainn creideamh eaconomaigeach nua-libearalach ann am Breatainn, dòigh smaoineachaidh a bhrosnaich Thatcher is Regan? Gu dearbha, carson nach eil Alba deònach slighe eadar-dhealaichte a ghabhail? ’S tric a chluinnear mu staing taigheadais, anns an Eilean Sgitheanach gu sònraichte, sna làithean seo agus ràith thurasachd cho trang ’s a bh’ againn a-riamh air a bhith ann am-bliadhna. ’S e duilgheadas dha-rìribh a tha seo a sheallas dhuinn a-rithist na thachras nuair a leigeas sinn leis a’ mhargaidh eaconomaigeach cùisean a stiùireadh dha fhèin. Carson a tha sinn fhathast a’ leantainn creideamh eaconomaigeach nua-libearalach ann am Breatainn, dòigh smaoineachaidh a bhrosnaich Thatcher is Regan? 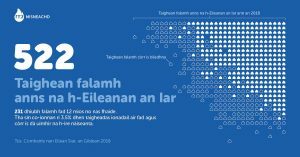 Gu dearbha, carson nach eil Alba deònach slighe eadar-dhealaichte a ghabhail? Tha na dùthchannan Lochlannach a’ faighinn buannachd à turasachd cuideachd, ach ma thadhaileas tu air Nirribhidh, mar eisimpleir, aithnichidh tu gu bheil gnìomhachasan is gnothaichean ann ri taobh turasachd, fiù ’s air an dùthaich. Thathar a’ faireachdainn nach eil gach rud aca a’ crochadh gu h-iomlan air turasachd, gu bheil ro-innleachd air choireigin ann a nì cinnteach gu bheil co-chothrom ann is nach fhaigh turasachd làmh an uachdair air an eaconomaidh, a’ tachdadh gach rud eile mar a chithear a’ tachairt ann an Alba. Tha cion-lèirsinn gar dalladh. Chan urrainnear ceistean mu thurasachd a thogail gun daoine a’ dìon an t-suidheachaidh mhì-chothromaich a th’ ann an-dràsta. “Tha sinn ag iarraidh gum bi an t-Eilean fosgailte” (do luchd-turais a-mhàin mas fhìor is chan ann do luchd-obrach no ar n-òigridh fhèin), “Na bi cur sìos air an àite” (is tu ag amas air cùisean a leasachadh), “Tha luchd-turais riatanach do dh’obraichean” (ma tha sinn toilichte le obraichean ràitheach mì-chinnteach gun àite-fuirich aig na luchd-obrach sin nas motha), “Ach tha iad a’ toirt airgead don sgìre” (is sinne gun mhisneachd gun urrainnear airgead a dhèanamh à dad sam bith eile ach taighean a chur air mhàl is trealaich a reic). ’S àbhaist a-nist do mhòr-shluagh ar dùthcha a bhith a’ coimhead tro shùilean nua-libearalach. ’S e nua-libearalas a stèidhicheas na slatan-tomhais againn, agus ’s e ‘fàs eaconomaigeach’ a gheibh urram thar gach rud eile. Chan eil àite againn airson breithneachaidh chàileachdail, chan eil duine againn a chuireas a’ cheist “Cò dha a tha fàs?”, no “Cò as motha a bhuannaicheas?”. 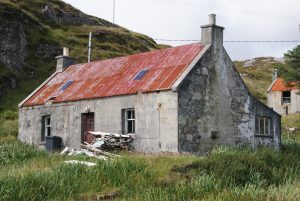 Chuala am buidheann thar-phàrtaidh air Poileasaidh Dùthchail, aig Pàrlamaid na h-Alba, an-uiridh bho John M Bryden, ollamh air foghnadh le Oilthigh Obar Dheathain, is e a’ lìbhrigeadh òraid air Poileasaidhean agus Toraidhean Leasachaidh Dhùthchail, Nirribhidh1. Rinn an t-Ollamh Bryden soilleir dhaibh gu bheil amas aig luchd-poileataigs san dùthaich ud co-chothrom sgìreil a bhith aca. A thuilleadh air sin, ’s ann air ìre bith-beò agus so-sheasmhachd a tha sin stèidhichte a bharrachd air fàs eaconomaigeach. Tha plana gnìomh aig Riaghaltas Nirribhidh airson na h-amasan aca a choileanadh, is iad a’ cur air dòigh na rudan a tha dhìth orra, gu sònraichte ann an àitichean ‘iomallach’; eadar-cheanglaichean, rathaidean, aiseagan, ceanglaichean adhair, eadar-lìon banna-leathainn, is msaa. Tha iad a’ tuigsinn gur e obair an Riaghaltais a bhith a’cur an aghaidh miann a’ mhargaidh gach rud a tharraing don mheadhan. ’S e duilgheadas eadar-nàiseanta a th’ ann an turasachd an-dràsta le àitichean leithid Venice, Barcelona, fiù ’s Dùn Èideann fhèin a’ beachdachadh air cìsean is dè ghabhadh a dhèanamh mu thaighean a tha air mhàl son saor-làithean. 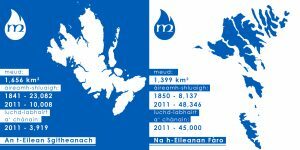 ’S ann gu math beag a tha na h-Eileanan Fàrach, 49,000 neach a’ fuireach ann, ach le mu 160,000 a’ tadhal orra am-bliadhna. Thoradh air sin, tha ro-innleachd ùr aca a bhios ag amas air àrdachadh ann an teachd a-steach, seach àireamhan de luchd-tadhail. ’S e an lèirsinn aig cridhe a’ phoileasaidh gum bi gnìomhachas turasachd so-sheasmhach, leantainneach aca, a choileanas feuman an t-sluaigh Fhàraich, na h-àrainneachd agus na h-eaconomaidh san fharsaingeachd2. Tha iad a’ tuigsinn gum feumar a bhith faiceallach agus an cultar, an cànan agus gu dearbh an dachaighean a dhìon. Mar as trice ann an Alba ma chluinneas tu dad ris an canadh tu ‘ro-innleachd’ ’s e gum bu chòir gun togar taighean-beaga no àitichean-pàircidh a bharrachd a bhith againn; fàs, co-fharpaiseachd agus àireamhan3. Chan eil duine againn ag ràdh nach fhaodadh turasachd a bhith mar phàirt de dh’eaconomaidh eadar-mheasgte, ach tha cunnart ann, le gainnead taigheadais agus àireamhan ro àrd de luchd-tadhail, gun tachd turasachd gach rud eile gus an tachd i turasachd fhèin. Chan eil àitichean-fuirich aig luchd-obrach an-dràstadràsta agus bheir sin buaidh air taighean-òsta agus taighean-bìdh cho math ri gnìomhachasan eile leithid oifigean luchd-lagha is ailtirean, sgoiltean, seirbheisean-èiginn agus ospadalan4. Tha na h-àitichean tadhail mar Bhodach an Stòir agus Glumagan nan Sìthichean a’ taomadh le daoine mar-thà is ruigidh sin ìre far nach bi iad idir cho tarraingeach tuilleadh. Gun smachd no ro-innleachd a tha mothachail air feuman an t-sluaigh, tha turasachd comasach air gach rud a mhilleadh, nam measg choimhearsnachdan a tha cugallach mar-thà, a’ Ghàidhlig a tha fiù ’s nas cugallaiche, gnìomhachasan prìobhaideach agus seirbhisean poblach. Agus mu dheireadh, mar a sheall nua-libearalas iomadh turas roimhe, tòcadh is sgàineadh (boom and bust) is mathaid nach bi turasachd fhèin an ìre mhath air fhàgail againn. Ach cha bu chòir dhuinn idir a bhith an crochadh air turasachd air a’ Ghàidhealtachd. Tha coltas ann an-dràsta nach eilear a’ smaoineachadh air a’ Ghàidhealtachd agus na h-Eileanan ach mar raon-cluiche do dhaoine beartach is luchd-turais. Ach cleas nan Nirribheach, is grunn dhùthchannan eile san Roinn Eòrpa, carson nach ullaich sinn plana eaconomaigeach ag amas air eaconomaidh eadar-mheasgte ann an sgìrean dùthchail? Chan eil ar n-òigridh uile sàsaichte le obraichean samhraidh a’ frithealadh dhaoine ann an taighean-òsta. ’S beag an t-iongnadh gum fàg a’ mhòr-chuid, mura h-eil cosnaidhean luachmhor no taighean aca dè nì iad ach na casan a thoirt leotha? (is an cànan cuideachd). Tha dleastanas aig an Riaghaltas cothroman a thoirt don òigridh obraichean is àitichean-fuirich fhaighinn anns na sgìrean aca, agus ar cultar, ar cànan agus ar coimhearsnachdan a dhìon agus a leasachadh. Tha seo fìor airson gach pàirt den dùthaich is chan ann a-mhàin do fhrith-bhailtean nam bailtean-mòra. Tha cothroman ann am pailteas, fiù ’s ann an sgìrean mas fhìor iomallach, gnìomhachasan ùra seasmhach agus luchdmhor a stèidheachadh, mar a thachras air feadh an t-saoghal ann an dùthchannan nach eil air gèilleadh buileach glan don mhargadh shanntach nua-libearalach. ’S urrainnear teicneolasan a leasachadh leithid Fiodhrach Crois Lannaichte, CLT (Cross Laminated Timber)5 no glutadh fiodhrach snàithleach (wood fibre insulation)6 fo stiùireadh an Riaghaltais an toiseach, ach le bhith a’ dèanamh sin bhiodh gnìomhachasan mu thimcheall an leithid a’ toirt obraichean math do dhaoine is a’ cur ris an eaconomaidh san fharsaingeachd. Mar an ceudna, tha cothrom ann an cuaraidh sglèat aig Baile a’ Chaolais fhosgladh a-rithist, chan ann aig meud coimeirsealta, ach aig ìre bheag ionadail a bhiodh a’ frithealadh ath-nuadhachadh air togalaichean liostaichte, nuair a dh’fheumas tu sglèat dùthchasach à Alba a chleachdadh7. San latha an-diugh nan cuirte air dòigh bun-structar ceart mar eadar-lìon banna-leathainn chan eil mòran ghnothaichean nach b’ urrainn a bhith ann, gnìomhachasan cruthachail, seirbheis no ionmhasail is an leithid. Anns an Eilean Sgitheanach shoilleirich Sabhal Mòr Ostaig, is na chuir Iain Noble air bhonn ann an Eilean Iarmain, gum b’ urrainnear adhartas a dhèanamh le lèirsinn is beagan in-ionmhais. ’S mòr a shoirbhich na Basgaich le companaidh cho-chomainn ris an canar Mondragon8, ’s luach £22 billean agus le teachd a-steach de £12 billean gach bliadhna. No mar a mhìnich an t-Ollamh Bryden,Terningen Nettverk9ann an Nirribhidh far an stèidhichear co-chomann gnìomhachasan, dàimheil ach diofaraichte, airson leasachaidh phroifeiseanta is ùr-ghnàthachais ann an sgìre iomallach. Thugar 30 gnìomhachas beag ri chèile airson co-obrachadh, pàirteachadh is tomad tàbhachdach a ruigsinn a thaobh in-ionmhais. Nach fhaod modail ghnothachais coltach ri seo a bhith ann an Slèite gus togail air na thachair mar-thà? No fiù ’s an leithid a’ cur air dòigh às ùr ann an sgìrean eile? Aig ìre bhunaiteach ge-tà feumaidh luchd-riaghlaidh a bhith ag amas air bun-structar tòrr nas fhearr, mar a thathar a’ leasachadh ann an Nirribhidh; aiseagan, ceanglaichean adhair, drochaidean, tunailean, taigheadas sòisealta agus taighean air phrìs reusanta. ’S e cearcall buadhach a bhiodh anns na leasachaidhean seo, ach mar chiad cheum, ’s ann air an Riaghaltas a tha an t-uallach lèirsinn a shealltainn mu na dh’fhaodadh a bhith ann.